Container shipping is living up to its reputation for combining strong demand growth with poor profitability. 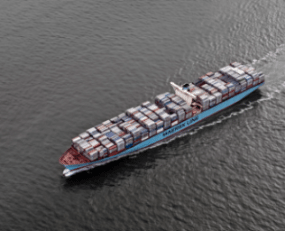 The leading container shipping line Maersk issued a profits warning at the end of last week, stating that its new “expectation for earnings before interests, tax, depreciations and amortisations (EBITDA) is in the range of US$ 3.5-4.2bn and a positive underlying profit. The previous expectation for EBITDA was in the range of US$ 4.0-5.0bn and an underlying profit above 2017 (US$ 356m)”. The cause of this was higher bunker fuel costs which jumped by 28%. The problem was that even though freight rates were supposed to be firming, customers refused to pay the full ‘bunker-fuel surcharge’. On Monday, Hapag Lloyd reported a not dissimilar problem, with profit growth also depressed. Stripping out the acquisition of United Arab Shipping Company (UASC), volumes increased 3.9% and freight rates were up 3% over the first half of the year. However, the company saw the price of bunker fuel rise from US$312 a tonne in H1 2017 to US$385 a tonne in H1 2018. Rolf Habben Jansen, Chief Executive Officer of Hapag-Lloyd described the first half of the year as being “shaped by clearly increasing fuel costs, higher charter rates and a slower than expected recovery of freight rates”. Although its acquisition pushed up EBITDA by 16% year-on-year, profits margins fell. Earlier in the month, COSCO had a parallel experience, slumping to a loss caused by higher fuel costs. Yang Ming has also reported being hit. Admittedly, oil prices have risen significantly and quickly over the past few months, driven by production problems in Libya, Venezuela and even Canada. However, this does not explain the inability to pass the prices on to customers. All these shipping companies report higher volumes, up at least the in low to mid-single digit percentages, reflecting robust global trade growth. What appears to have happened is that freight rates had hit some form of equilibrium earlier in the year, an equilibrium that was unset by the sharp rise in fuel prices. The market simply was not strong enough to absorb this and so ‘margin compression’ was forced in the shipping lines. It suggests that consolidation amongst container shipping lines has so far not worked.